If I were selecting books on conservative and/or Republican African Americans to review in tandem, I would have taken the obvious, less creative route of reviewing Joshua Farrington's Black Republicans and the Transformation of the GOP alongside fellow historian Leah Wright Rigueur's The Loneliness of the Black Republican. 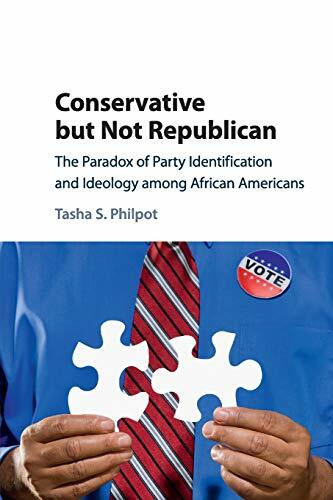 Then I would have put Tasha Philpot's Conservative but Not Republican in conversation with Conservatism in the Black Community, the 2013 monograph written by fellow political scientist Angela Lewis. I applaud the review editors of this journal for promoting interdisciplinarity by forcing a dialogue between Farrington and Philpot, who through their books both make important contributions to our understanding of the often-ignored partisan and ideological heterogeneity within black communities. Because African Americans are currently the most consistent and loyal Democratic voting bloc in the United States, popular discussions of black political behavior often paint this community with broad strokes and dismiss many individual expressions of nonliberal and non-Democratic worldviews as aberrant and racially disloyal and ignorant. Farrington and Philpot properly challenge us to rethink the notion that black conservatives or black Republicans are weird or somehow disconnected from their racial identities. Farrington's story places mid-twentieth-century black Republicans at the center of civil rights debates, while Philpot finds that blacks and whites who identify as conservative do so for different, often racialized reasons, which has important implications for party identification. Farrington describes the evolution of black Republican Party activism over the course of the twentieth century. 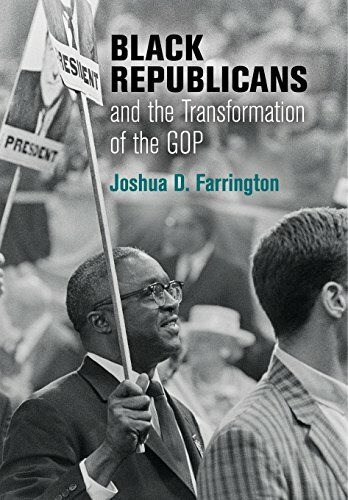 While briefly tracing the history of black Republican partisanship from the Reconstruction era, Farrington writes a vivid account of black Americans’ shift from supporting the Republican Party to the Democratic Party. He argues that economic considerations were the primary driver of blacks’ secular realignment with the Democratic Party. Most importantly, he makes an important contribution to the literature by noting the class and regional differences between those who defected early to the Democratic Party and those who were more likely to remain Republican during the New Deal/post–World War II era. For instance, in discussing the robust Republican organizing efforts among blacks who could vote in southern cities before the passage of the Voting Rights Act, Farrington highlights an important contingent of blacks who, by virtue of their daily experiences with Democratic-dominated, Jim Crow state and local government, were unmoved by Democratic outreach efforts to black voters in other parts of the country. In addition, Farrington finds evidence that some of the most prominent black Republicans were ardent supporters of bourgeois capitalism. They opposed the New Deal out of a sincere belief that the relief efforts sponsored by the Franklin D. Roosevelt administration would create a cycle of dependency in black communities, and they objected to the union organizing efforts that were being championed by Democrats, often because of their occupational status in the managerial class. Being business-minded and having professional occupations distinguished these Republican activists from other blacks and served as precursors to future generations of pro-business black Republicans. Despite the bourgeois tilt among black Republicans after the New Deal, Farrington argues that this cohort was indistinguishable from their black Democratic counterparts in terms of civil rights activism and social capital building within black communities. Throughout the mid-twentieth century, black Republicans were active members of groups such as the NAACP and the Black Elks. Farrington highlights the careers of black Republican politicians such as Archibald Carey, who served as an alderman in Chicago from 1947 to 1955 and helped found the Congress of Racial Equality (CORE), and Grant Reynolds, a Harlem Republican who successfully prevented Adam Clayton Powell from winning both the Democratic and Republican nominations for Congress in 1946 (Powell ran in both the Democratic and Republican primaries for his congressional seat—presumably a nod to the fact that many of his constituents still identified as Republican). He also name-checks a number of prominent black Republicans with ties to civil rights activism or black community building during the early to mid-twentieth century, including Benjamin Hooks, Jackie Robinson, the King family, and John Wesley Dobbs, the grandfather of Atlanta's first black mayor, Maynard Jackson. Black Republican activism focused not only on national civil rights issues but also on ensuring that the GOP engaged black voters and issues. Farrington notes that a cadre of black Republican activists in the 1950s and 1960s, such as Val Washington, Clarence Townes, and Helen Edmonds, worked diligently to improve GOP outreach to black voters. Farrington charts the relative success of the Minority Division of the Republican National Committee (RNC) in increasing African American support for Dwight D. Eisenhower's reelection in 1956, and he notes how the GOP faltered among blacks when the RNC failed to fully fund outreach efforts to blacks in 1960, despite the ardent protest of these activists. Farrington frames the frustrations that black Republican activists experienced within their party in the context of the rise of the conservative wing of the Republican Party. Most of the black Republican activists of the mid-twentieth century aligned themselves with the establishment wing of the party and with liberal, pro–civil rights politicians such as Jacob Javits and Nelson Rockefeller of New York and George Romney of Michigan. Farrington notes, though, that as early as the late 1950s, a more conservative form of Republicanism—which embraced states’ rights and regarded Barry Goldwater and Ronald Reagan as their standard-bearers—was gaining currency within the party. At first, black Republican activists were emboldened to challenge the conservative onslaught, but their efforts were eventually hampered by intraracial tactical disagreements, which were sometimes stoked by white RNC leaders who gave preferential treatment to less confrontational black party members over black Republicans who were openly critical of the party's vision and direction. By the early 1980s, Farrington notes, the public face of black Republicanism had shifted from more ideologically moderate activists with strong ties to civil rights organizations to more conservative figures who had more tenuous ties to black communities. In many ways, Philpot's analysis picks up where Farrington's account ends. In charting the rise of the conservative wing of the Republican Party and the increased visibility of more ideologically conservative black Republicans, Farrington implicitly wades into discussions of ideological sorting, or the observation that in recent years, partisan, and ideological orientations have become increasingly correlated with one another (with liberals being more likely to identify as Democrats and conservatives being more likely to identify as Republicans). As scholars such as Matthew Levendusky and Alan Abramowitz have noted, this phenomenon is increasingly common and a key consideration when trying to explain increased polarization in American politics. Philpot astutely points out, though, that ideological sorting operates differently in black communities. Substantial proportions of blacks simultaneously identify as conservatives and as Democrats. To try to understand why blacks do not seem to ideologically sort at the same rate as their white counterparts, Philpot employs a mixed-methods research design to unpack the building blocks of ideological orientation. Using original survey, interview, and content analysis data, Philpot finds that whites frame ideology in terms of attitudes toward social welfare, morality, religion, and the role of government. In contrast, blacks conceptualize ideology based on their attitudes toward social welfare and religion. Philpot argues that the racial experiences of both groups shape the differences in ideological framing, causing both groups to weight issues and attitudes differently. Philpot argues that the differences in issue weighting across groups helps explain why blacks are less likely to identify as Republicans, even when they are conservative. She also contends that racial group consciousness may explain conservative blacks’ reluctance to identify as Republicans. Here, Philpot is more limited in her analysis, as her original survey samples have a negligible number of black Republicans, thus limiting the statistical power of her analysis (though she reports significant differences when comparing black Democrats and Republicans). While she does try to overcome the sample size problem with additional analysis using pooled American National Election Study data, her findings are mixed. For instance, while blacks who have more positive feelings for blacks over whites are significantly more likely to prefer the Democratic Party (which should not be confused with actual party identification), blacks who identified as conservative were only statistically more likely to identify as Republicans during the Barack Obama era. Moreover, Philpot does not find a statistically significant relationship between the interaction of ideological identification and preference for blacks over whites (or vice versa) and party identification or affect. All of this suggests that black party identification is complicated, complex, and worthy of continued study. Both Farrington and Philpot should be commended for providing nuanced analysis of underresearched topics within black politics and history. Moreover, as someone who read these works while preparing syllabi for both undergraduate- and graduate-level classes in race and politics, I am happy to recommend both of these works as course readings for students studying African American political behavior. These books tackle important, sometimes controversial topics in an accessible way. I have already incorporated their findings into my teaching, and I look forward to the opportunity to continue to engage these works with my students in future semesters.